SSD firmware is the software that works as an interface between your PC hardware and the SSD. Fixing performance and compatibility issues or bugs is done by firmware changes. That’s why you need to keep the firmware updated. update the SSD’S firmware. If the SSD is not empty, back up your data before updating the firmware. Sometimes it may end up in a drive failure because of the conflict between the hardware of your PC and new firmware. When possible, is a good idea to reduce unnecessary writing on SSDs. This is the key to maximizing an SSD lifespan. The following tips help you accomplish that. When a user performs a delete command, the data will be deleted entirely. There is no possibility to recover it. Using a data wiping software on SSD to write with 0s and 1s your SSD’s empty space, will consume a full write cycle and will reduce its lifespan. On HDDs, the delete command marks sectors as deleted. 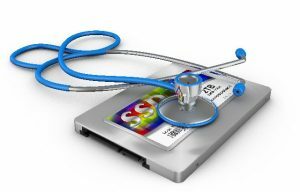 A data recovery software can quickly recover data from these marked sectors. A data wiping software will overwrite these sectors with 0s and 1s making them free from recovery. Though, there is an exception. Recent research shows that data will not be permanently destroyed when you delete an entire drive. You need to use specialized data eraser software that supports SSDs. I do not recommend you to use your SSD for your large media files such as movie files. Every write counts for an SSD’s lifespan, and larger files will consume your writing cycle quota faster. Your media files don’t need the speed provided by an SSD. There’s no noticeable difference in speed when you play movies from HDD or SSD. Your operating system, your browser and other programs installed on your PC create temporary files. Since these files are created very frequently, it can be a burden to your SSD if they are written on it. If you use two drives on your PC, I recommended you to set temporary files to be written on HDD. The last three tips are for Windows OS users. Every time you hibernate Windows, the memory currently in use is saved to a file. If this file is written on an SSD, it can stress your SSD and degrade its lifespan. Unlike conventional HDDs, SSDs don’t need any indexing for finding files, because they are fast enough. Windows may write several gigabytes in the paging file, depending on the size of your RAM. If you use your SSD as the location for the page file, it can degrade your SSD life. Add more RAM to your PC and turn off the page file, or move its location to an HDD if you have a secondary drive in your PC.